Maple Glazed Ham is on the menu with big, thick, juicy slices of succulent ham with a sweet orange-scented maple glaze. To me, the best part of the ham is the sticky sweet glaze. I don’t have to miss out with my sugar-free Maple Glaze. 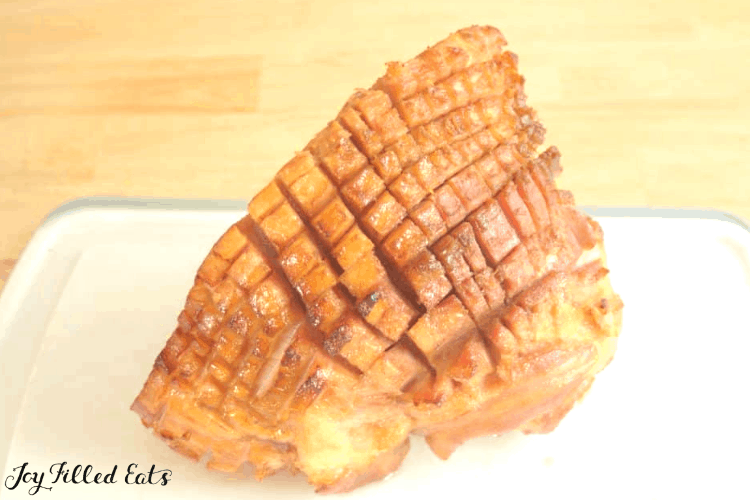 It complimented the saltiness of the ham perfectly and gave a golden brown shine after baking. When my local grocery store does holiday promotions for a free turkey or ham I always make sure to get one. Either means three or four dinners for my family if we aren’t hosting Easter or Christmas that year. 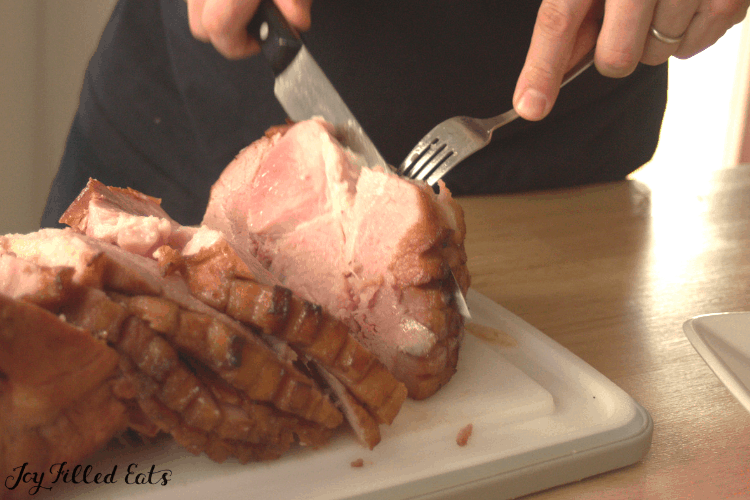 Most of the time I do get a ham because it is easy to cut up and freeze in smaller portions. 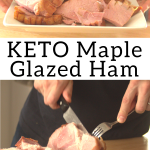 To make the sugar-free maple glaze for the ham I simply melt down my sugar-free sweetener to a liquid and then add maple extract and orange oil to flavor it. It is easy to bake a ham. First, I cut the skin into a criss-cross pattern so the glaze can seep down into the skin. Then I bake the ham for about 5 hours (this will vary based on the size of the ham). I increase the baking temp when the ham is almost done. A few times during baking I glaze the ham with the sugar-free maple glaze. 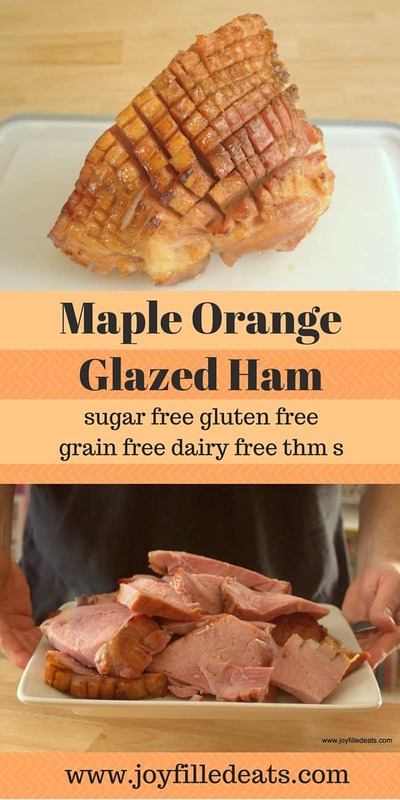 Maple Glazed Ham is on the menu with big, thick, juicy slices of succulent ham with a sweet orange-scented sugar-free maple glaze. To me, the best part of the ham is the sticky sweet glaze. Preheat oven to 250. Put the ham in a large baking dish. I cut the cross marks around both sides so the glaze would seep into the meat. Make the glaze. Cook the sweetener and butter over medium heat until melted. Add the maple extract and orange oil. Brush 1/3 glaze on the ham immediately. Put 1 cup water in the bottom of the baking pan and cover the whole thing with foil. Bake for 4 hours. Remove from the oven and brush 1/3 of the glaze on. Raise oven temperature to 300. Recover with the foil. Bake for 30 min. Remove from the oven and brush the rest of the glaze on. Bake uncovered at 350 for 30 minutes. 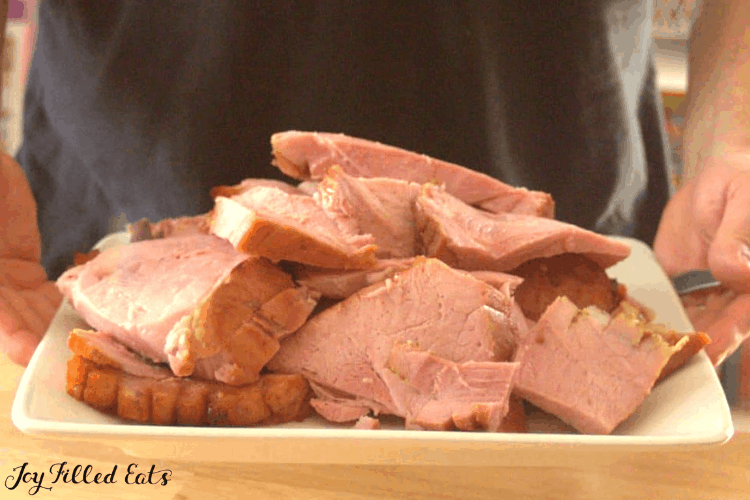 Make sure the internal temperature of the ham is at least 140 for a pre-cooked ham. Let rest for 5-10 minutes before slicing. 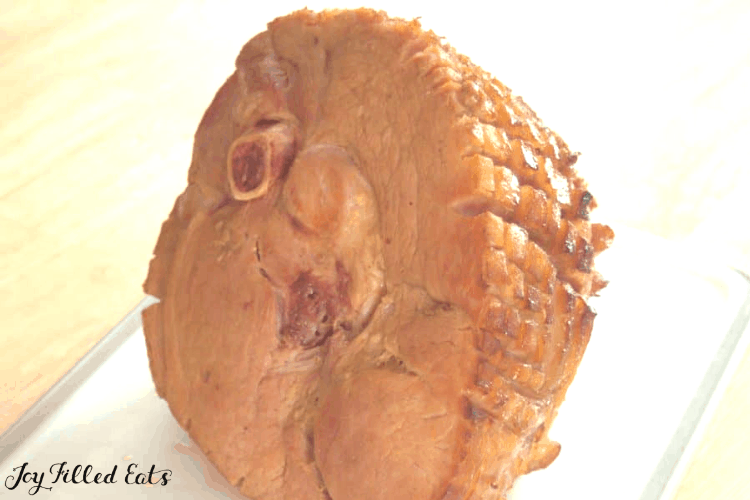 We prefer big thick juicy slices to the thin ones from a spiral ham. Orange Oil.. is that an essential oil? Or something I can find in the ethnic food section? 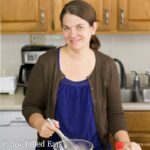 If it is an essential oil, what type is safe for food consumption? The one I have is an extract. Some EOs are safe for consumption. Just check on the label. Oh ok, thank you. That is helpful! So, just 4 drops of Orange extract?